Stitch markers are little round items–usually made of plastic or metal–that can be slipped onto a knitting needle to mark a certain place in a row. These are handy little accessories to have in your knitting toolkit and many will work for crochet projects as well. From marking a place in your row to holding dropped stitches until you can fix them, stitch markers have a number of uses. You can also choose to buy stitch markers or make them yourself. There two basic types of stitch markers and each can come in a variety of styles (e.g., plain, hearts, cute animals, beaded, etc.). The Ring Stitch Marker: This is a simple ring that can be slipped over the end of your knitting needle. Some of this type are in a tight spiral similar to a keychain so you can securely attach it to a yarn loop. Others are simply enclosed rings. The Locking Stitch Marker: This type is the most versatile for both knit and crochet projects. It has the shape of a safety pin but is shorter and rounder. Just like the pin, one end locks into the top piece to keep it secure. These stitch markers can be slipped over the needle or quickly locked into any loop in your knitting where you need to leave a mark. How Are Stitch Markers Used? Once you add stitch markers to your knitting, you will not know what you did without them. They have a variety of uses and can help solve a few common knitting mistakes. Stitch markers are often used to mark the end of a row in when knitting in the round with circular knitting needles–it is not obvious where the circle begins and ends. Slip a marker onto one needle when joining in the round and slip it to the other needle each time you pass by. Stitch markers can be used as a reminder for pattern changes. Slip one on the needle when you need to mark where increases, decreases, or blocks of different stitches should be placed. Did you drop a stitch? If you're reviewing a large portion of your knit work and notice a dropped stitch, don't panic or frog back to it. Simply grab a locking stitch marker and lock it into the loop to prevent it from unraveling. This buys you time to assess the severity and decide if you need to rip stitches and fix it or if you can return later and weave the stitch back in. If you're in a pinch, tie a small piece of contrasting yarn into the dropped stitch. Use stitch markers to count rows. If you're working a pattern that repeats often, you can place a stitch marker on every few rows and count as you go. For instance, you can place a stitch marker every 10 rows when knitting in garter stitch and then you only have to count how many groups of 10 you have (it's easier than counting 100 individual rows). This is helpful when matching the number of rows on the front and back of sweater pieces. Don't be afraid to use stitch markers often. Keep them in reach and find a good container for them. They do get lost easily because they're so small and cats and kids do love to play with them (they present a choking risk for young children). Stitch markers can be purchased at your local yarn store or online. There are many styles to choose from in either style. Be sure to pay attention to size as they can vary and you want stitch markers that will fit over your most used needles. Also, stitch markers often come in packs of 10 to 20 (or more) and this is not too much. It's better to have too many than too few and you might want to buy two packs at one time. They will get lost or forgotten on abandoned projects and some projects naturally require a lot of reminders as you work. A great variety of found objects can also be used as stitch markers. Some knitters use the flat plastic or long wire ties from bread bags. Others use old key chains or random rings from their crafting stash. 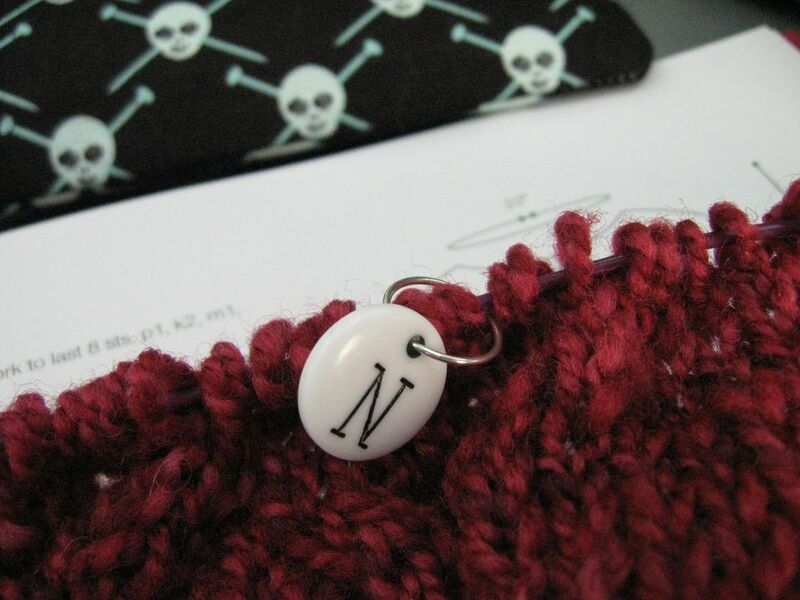 If you can slip it onto your needles, it can be a stitch marker. You can also add beads, bobbles, and other fun decorations. Handmade stitch markers make beautiful gifts for knitters and are relatively easy to make if you have a few beading skills.